It's tax season! And if you don't have the time, money or energy to head out and get your taxes done, tax software can be a lifesaver. The best versions just ask you a few questions and tell you which deductions you qualify for, whether that's the Canada Child Benefit, Child Disability Benefit or things like children's fitness and art activity credits – and then you can get your tax return ready in no time! The overwhelming part about all this can be choosing exactly which tax software is best for you and making sure it's compatible with the CRA's guidelines. There are plenty of different options to choose from, and many of them are free tax software programs! To help you out, we put together a list of the top-ranking tax software in Canada for 2018, so you can get your taxes done well before the April 30 deadline! TurboTax is one of the highest-ranked and most reliable tax software options in Canada. The cheapest versions are available online, and you can get the simplest edition for free! The standard edition will usually cost you $19.99, but you can get it on sale right now for $15.99 per return! 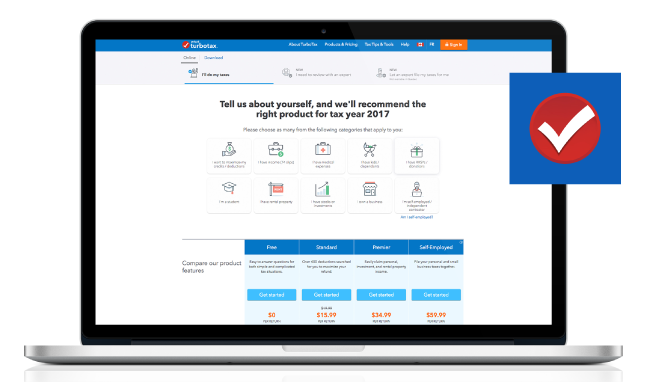 It's TurboTax's most popular option and will connect you with a tax expert to help out. And if you're wondering, everything is on sale at TurboTax until the end of the month! 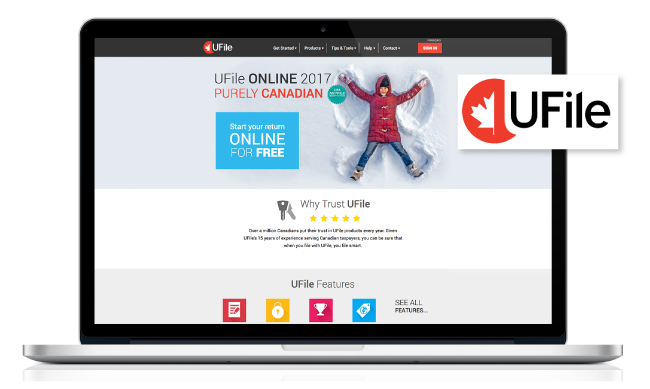 UFile is perfect for students, low-income families (with a combined household income under $20,000) and people who are filing a tax return for the first time. If you fall into one of those categories, you could be eligible for UFileFree, UFile's absolutely free program. And if you don't, no worries! They also have a few different paid options, including UFile Online which – you guessed it – lets you directly file your tax return online. We've probably all heard of H&R Block, and that's for a good reason. They make what can be the super-complicated (and sometimes intimidating) process of filing your tax return easy. They have three different online software options: Basic (which is free), Assistance ($15.99 per return) and Protection ($25.99 per return). All three options come with step-by-step guidance and helpful tax scenarios, and the more expensive ones also include features like audit protection, phone support and online storage – which means they'll store a copy of your return for years, just in case you need it again. 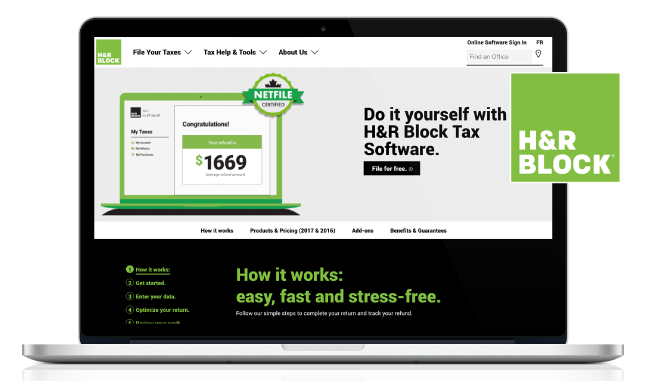 And yes, if using tax software isn't quite right for you, there's always the option to file your taxes at a H&R Block office. 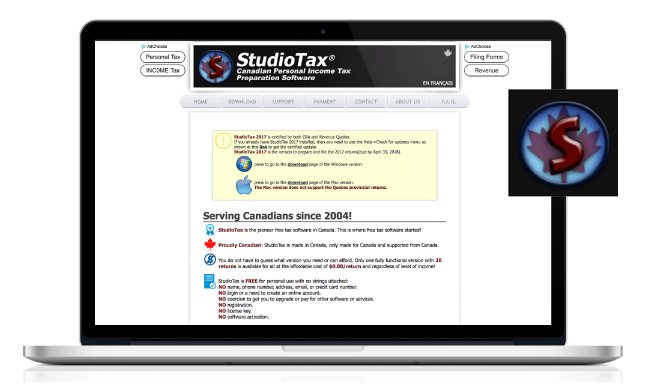 If you're not looking for any frills and just want to get right down to your tax return, StudioTax is for you! Amazingly, they are completely free for personal use, with no strings attached! To be very frank, this site isn't going to win any design contests. It's not the most user-friendly, and it definitely looks out of date. But the upside? It's CRA-approved, functional, completely free – and a lot of people swear by it. Plus, you can power through up to 20 returns at no cost! Let us know what your favourite Canadian tax software is below! Been using Studio Tax for years with no problem. It will import previous tax year returns as long as they were also done with previous tax year Studio Tax software.